As a kindergarten teacher, I believe strongly in the power of hands-on learning, and I can think of no better way of making this happen than through word work or math stations. But setting up stations so that they are independent and successful can be a daunting task. So I thought I’d take you through my process of how I do it each month, starting with the most important . 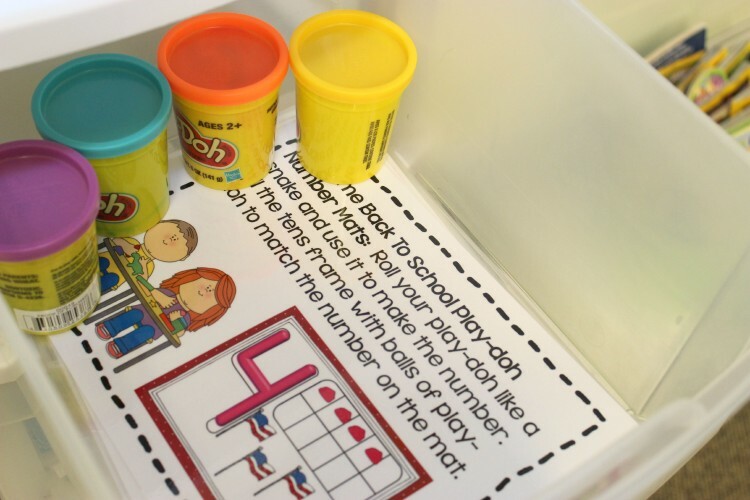 . . Steps for Setting Up Successful Math Stations. 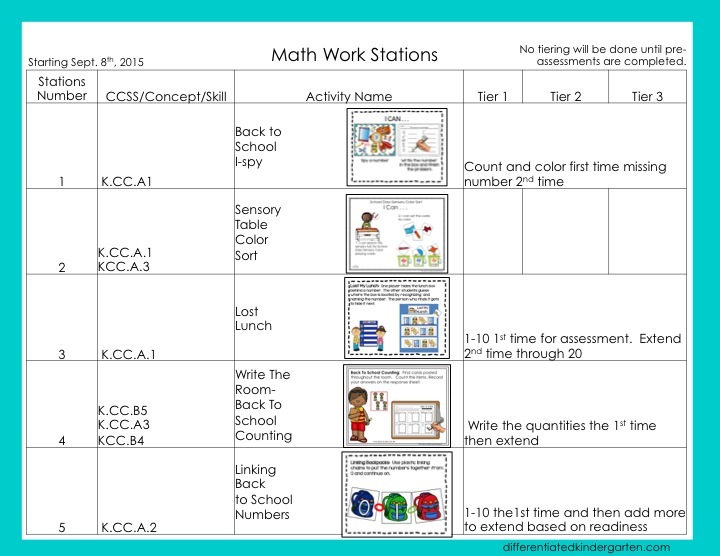 I’ve written about math stations before, but there’s so much to consider before your first student even arrives. I believe that by following me through the year as I start, tear down, change over, adjust and differentiate stations each month, you’ll really see the power of this amazing classroom resource. So let’s start at the beginning. Before you even start thinking about activities, first think about your set up, your structure and your plan for making stations work. Answering some of the following questions will help. How many students will participate at each station? How many stations will students attend each day? 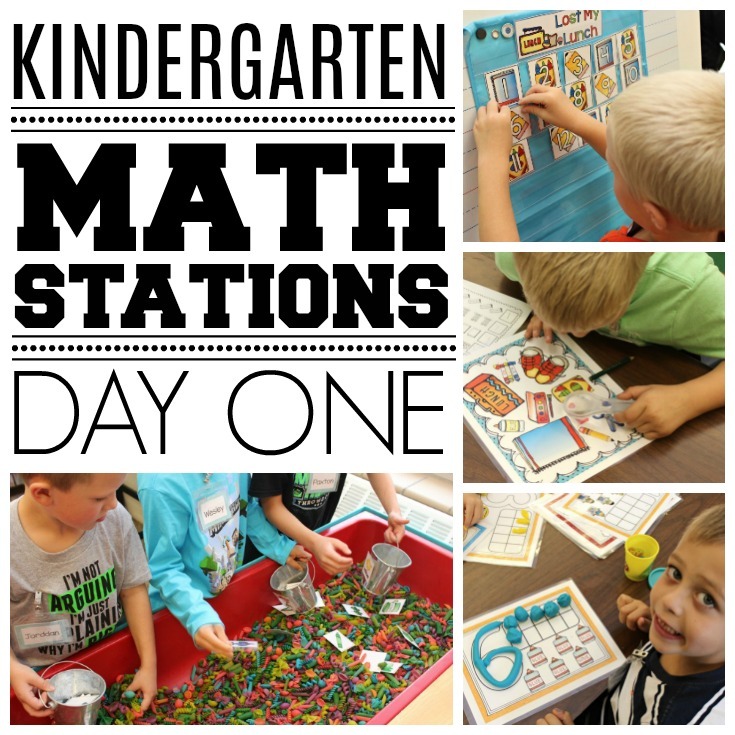 How many days a week will we use math stations? For how long will they be at each station? This will, at the very least, give you the basis for knowing how many stations you are going to need to plan for as you start your preparation. In my own classroom, I knew that I did not want more than 4 students to a station. 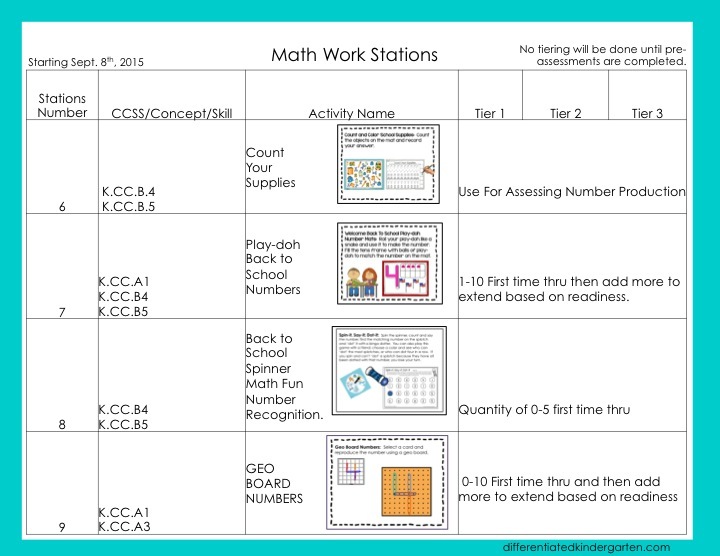 I wanted my students to attend two stations each time we had math stations, and I wanted them to rotate through each station twice before I changed them out. Based on that information, I came up with this lesson template for nine math stations. It didn’t matter if I had 20 students (That’s never happened!) or if I had 28 students (That has! ), I would have enough stations to allow for small, engaged groups. If you need something similar to my own template, feel free to click on it. It’s free, a Powerpoint and completely editable. 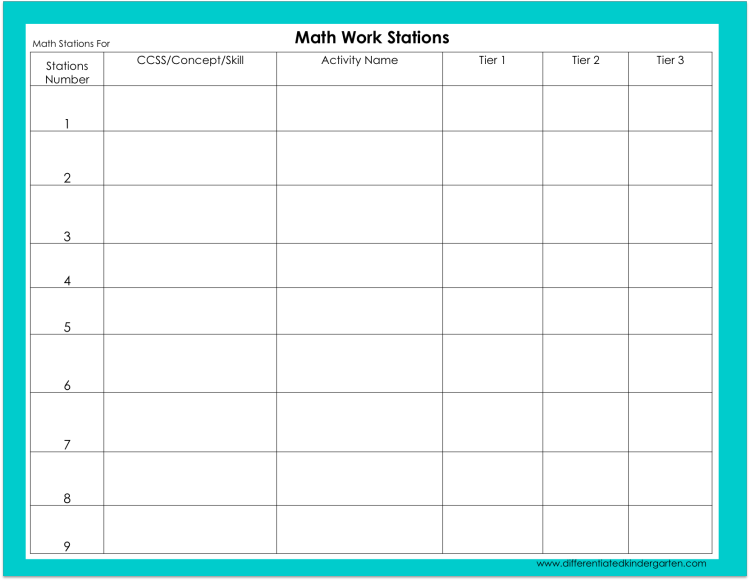 If I scheduled math stations for three times a week (We do other math activities, but this is strictly for math stations. ), these activities would last my students for 3 weeks! Three weeks before I had to change them out and after all that time, each child would have only experienced any one station twice so there was no chance for boredom! Generally, my stations last about 20 minutes each. I’m flexible during these first weeks, however, and gauge our time based on their stamina. Every class is different, but usually, 8-10 minutes is a good starting point. Even the best plans will fall apart if you don’t have a good system for storing, moving and controlling your activities. Because my room is so small, I knew I needed something that would be portable. I needed something that students could grab and take with them as we use all the areas of the classroom, not just tables. This is my math station before any of the magic of planning happens. Doesn’t look like much in this state. These three drawer Steralite drawers have been housing my math stations for nearly four years. The drawers come right out and can be carried where they need to be used. You can see an Iris brand set very similar to these by clicking HERE. Each drawer has a number label. (You can get a copy of these by visiting THIS post and grabbing them for free if you need them. ) Those same number labels will also be used above in a pocket chart, to indicate which students will travel to which stations. So if you have the number 3 by your name, you and your group will be going to station number 3. Once the timer goes off and a station is completed, all the numbers move down, one number moves off and a new number takes the first position. So in this case, as soon as we finish the first set of stations, Number 6 will move off, all the other numbers will down, and Number 9 will move next to the set of first names. 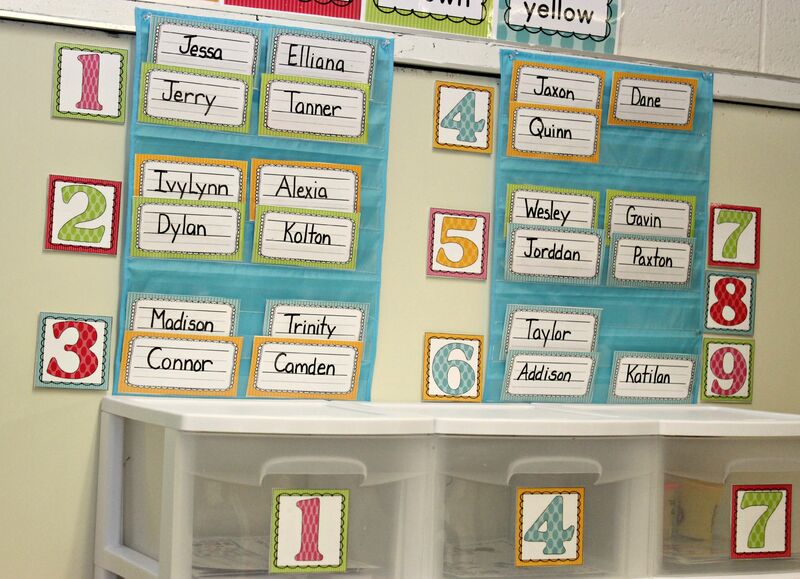 I went ahead and got my students’ names all listed and loaded into the pocket chart. Since I don’t know anything about my students, it’s really a random guess of who will work well with whom. No worries though, if I find a group that just isn’t meshing, I simply change them around. All those personalities and assessments for readiness in the first few weeks will give you invaluable information to make your groups each time you change stations. And yes, I change groups every time I change out new stations. You’re also going to notice that my student names are not printed off in a cute font print from the computer. This does have a reason I can guarantee you. It all has to do with differentiating with color, but for now, just ignore the fact there are different color name tags. It won’t mean anything until we start differentiating, and I’ll save that for a future post, I promise. Baby steps. I don’t want to scare you off. Because I’m going to have six stations going on simultaneously, anything I can do to assure that students move towards independence as quickly as possible is a HUGE benefit. One of the things I do that helps with this is establishing a ‘materials manager.’ It’s the job of the materials manager to take all the materials out of the drawer when the stations begin and put them all back when stations are completed. That doesn’t mean that they can’t solicit help from a team-mate. It just means, they’re in charge, and no one else can touch the materials unless the material manager says. I always have new material managers each time I change over stations, and you know, what kindergartener doesn’t love to a). help their teacher and b). be in charge. 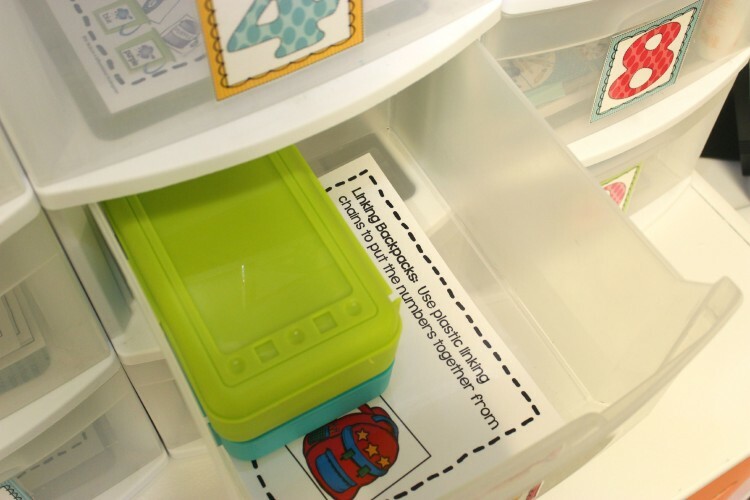 Another item that helps to build independence is having a visual cue card or ‘I can’ card in each station drawer. This gives students a little visual reminder of what their job is while they are at that station. Believe me, these little posters will save you oodles of ‘hey teacher . . .hey teacher’s.’ I promise. And finally, having activities that are familiar will go far. When I first started teaching, I used to think that I needed new activities every day. The truth is, kids love things that are familiar. So all the games and fun activities that they love in the fall, they still love in the spring. It’s just a new skill and a new theme. You extend that learning but keep them engaged. They DON’T get bored, and because you don’t have to teach a new set of activities every three weeks, their independence will flourish, and there isn’t that lag time in learning while they have to learn a new game. These first stations are going to set the stage for all the stations that come after. 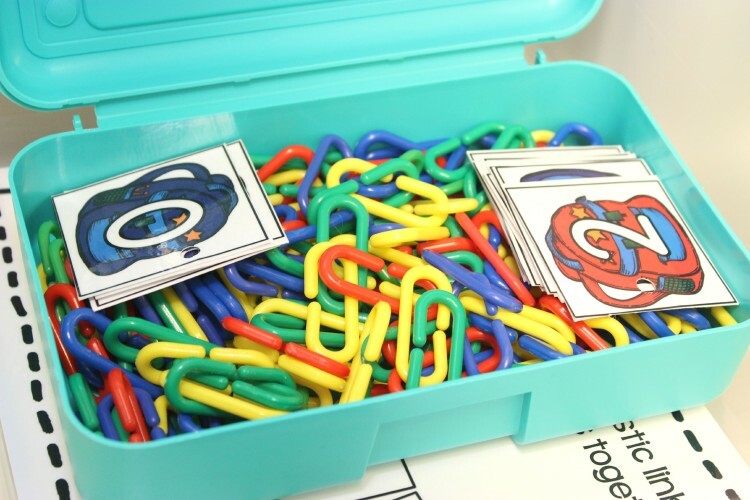 You want them to be engaging, give them a chance to explore materials that you will be using in future stations and throughout the year (play-doh, plastic links, magnifying glasses . . . whatever you use regularly), but also give you a chance to get a glimpse at what they know. I like to make sure I consider different learning profiles when I plan if at all possible. Having this little chart available in my plan book helps keep these in the fore front of my mind. You can get it by clicking on the picture below or grabbing it HERE. Yes. 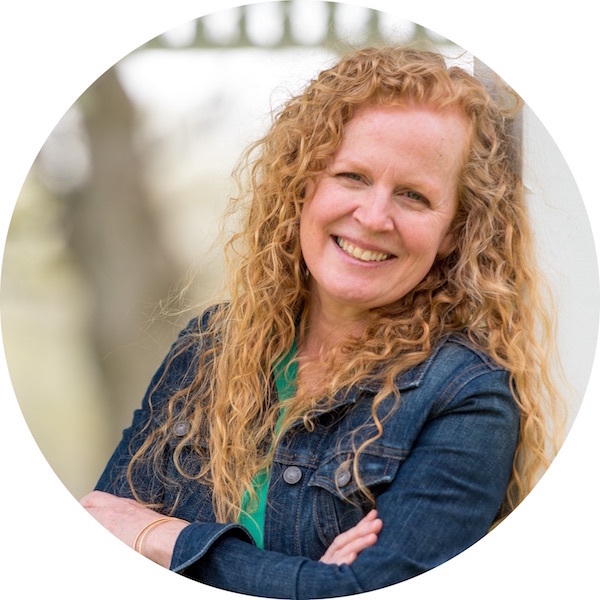 I know that this is a TON of work before we even get started, but I really believe that by doing the ground work now, is going to set the stage for success in the long run. Here’s a glimpse of my stations for this week. You will note that although this lesson plan is set up for differentiating, that’s not something we are ready for right now. But stay tuned. It’s coming. Here’s what these stations look like if you were to come in and open each drawer. I will happily show you them in action when my kiddos arrive next week, so make sure you check back but thought you should see what my students see when they look in their station drawer. Part of Back To School Math Stations Galore Resource, this is one of the stations that I will actually have thrown up on the document camera to show students how we count and color before hand. The first time through they will only go through and just practice counting the items. The second time through they get to count and color. 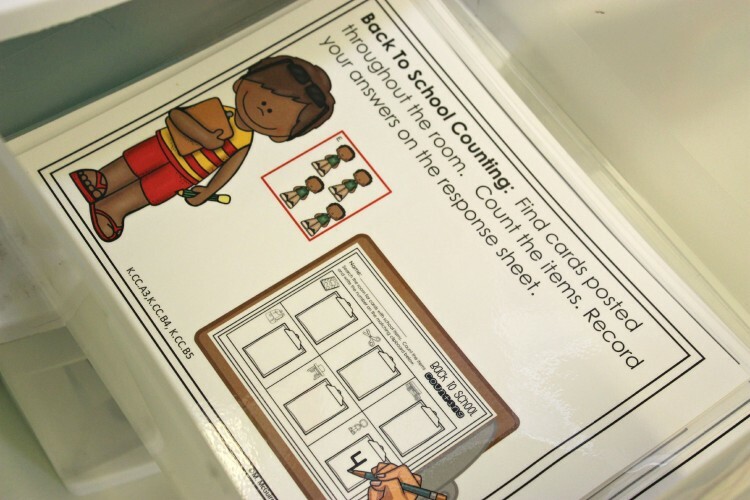 Back To School Write the Room – Counting Resource. 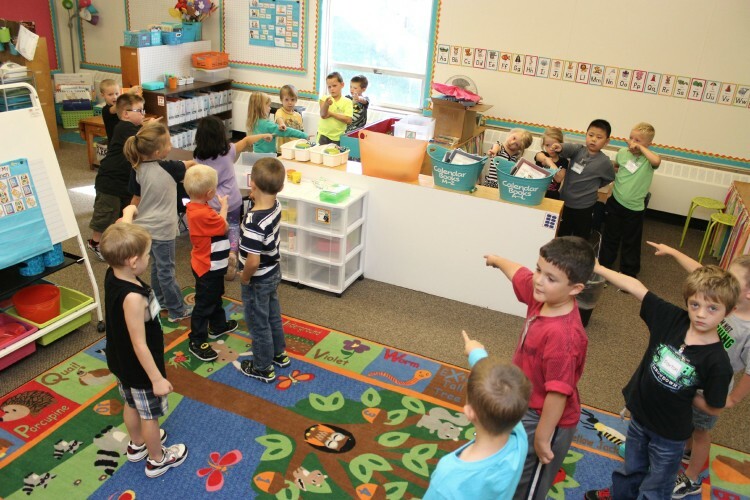 This is a great station to get them moving and teach them procedures and routines for using a clip board, moving through the room and recording their results. Most of the time, I have my students use a laminated recording sheet to record their answers. I am not a huge fan of lots of paper work, but I can easily check students’ answers against our answer key with this activity. And as the weeks go by, when I am doing small group math and can’t be interrupted, they have learned how to check their partner’s answers against the key. 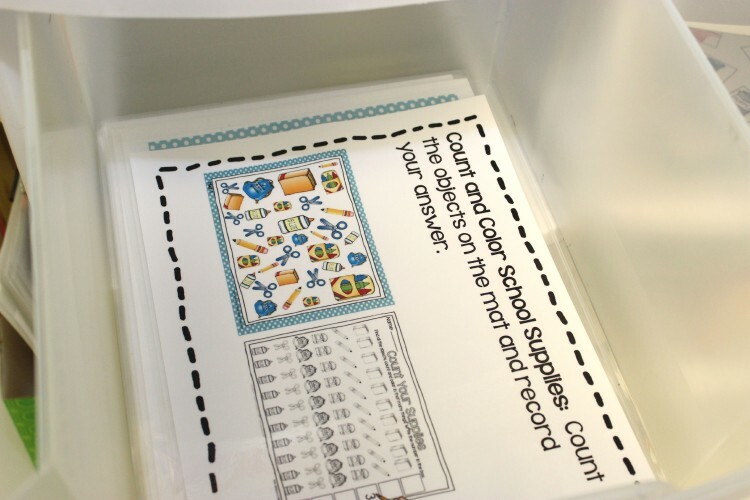 This resource is also from Back To School Math Stations Galore. These hide and seek games will follow my students through the year in both Math and Literacy. We simply change out the skills. It’s easily differentiated and tons of fun. 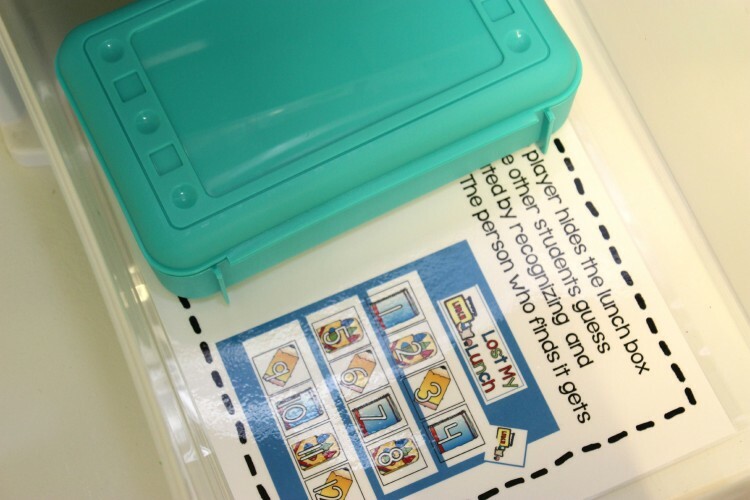 One student will hide a small lunch box behind a number card while the rest of his/her group hides their eyes. Then they simply take turns trying to find the lunch box by pointing and identifying numbers. I can’t wait to show you how my students play this next week. It’s always been a class favorite. When my students open Station Four, they will only find this visual cue card because this station takes place at my sensory table. If you know me, you know, I use my sensory table and then some. I have one table and several bins going on at any given time, so procedures and routines are a must. 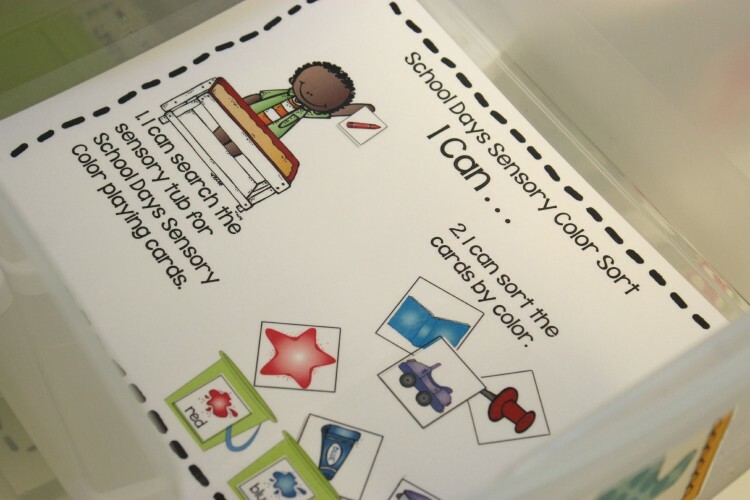 I like this activity because it is a great way to introduce sensory table while really practicing the rules, procedures, and clean-up. 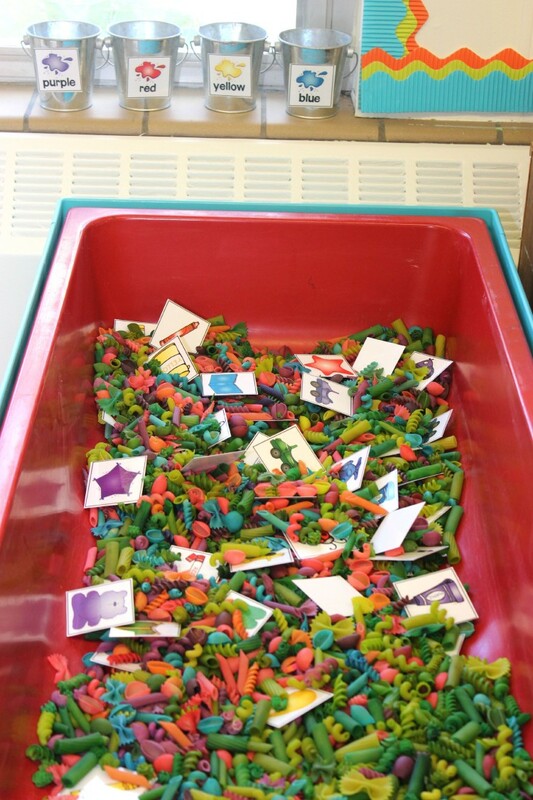 Modeling this and allowing students the opportunity practice the rules and clean-up will set you up for a successful sensory table for the rest of the year. It’s definitely worth the time you take to practice. 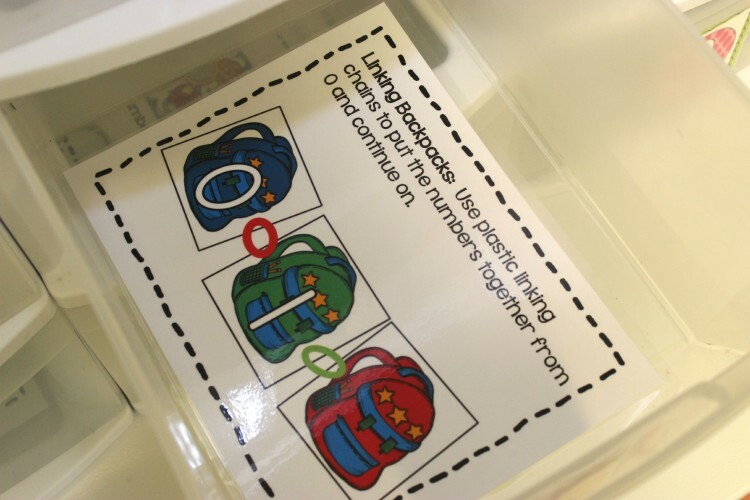 Another activity from Back To School Math Stations Galore, Linking Backpacks, allows students to practice using plastic links (you can see the ones I use by clicking HERE) and number order. The visual cue card gives them a friendly reminder of how to use the materials. I start out slow with only numbers 0-20 for this first time through, but I can quickly add more numbers or differentiate if needed. I-Spy resources are a staple in my classroom. Kindergarten kids love to play super spy and find missing numbers. 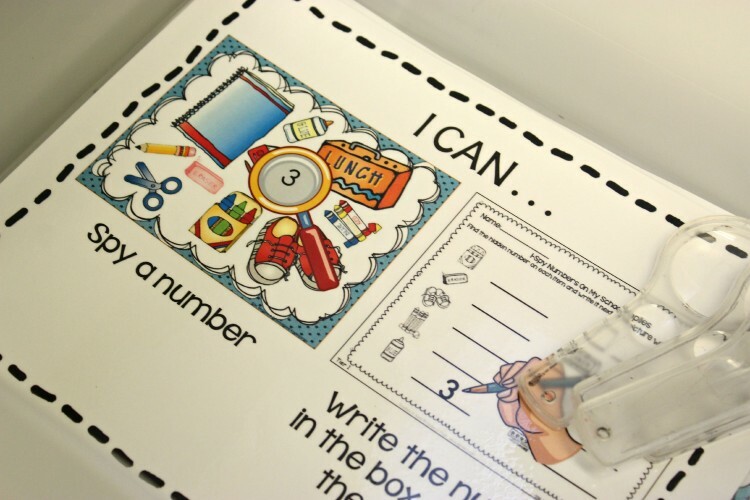 This is an easy resource from Back To Math Stations Galore that I use to let students explore with the magnify glasses, learn how to use them properly and get their feet wet. We use a laminated response sheet and there’s no pressure. The object of these first stations is all about learning to use the materials and activities correctly. Yes, I do let them play with the materials for a bit before they get started, because I know they NEED it. I set my timer and let them play. Then when the timer goes off, it’s my turn for them to work. What’s a kindergarten classroom without Play-doh? I can’t imagine. 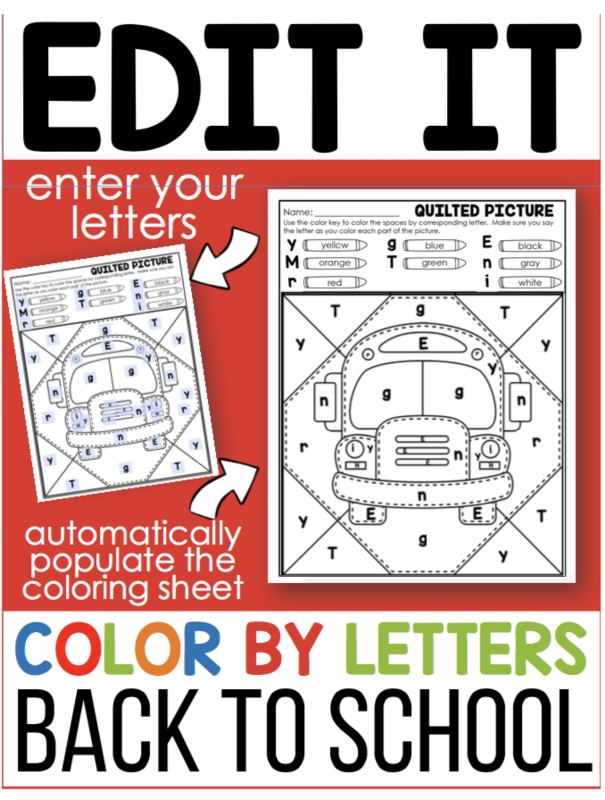 I use it darn near every day, because it’s so fabulous for building fine motor. 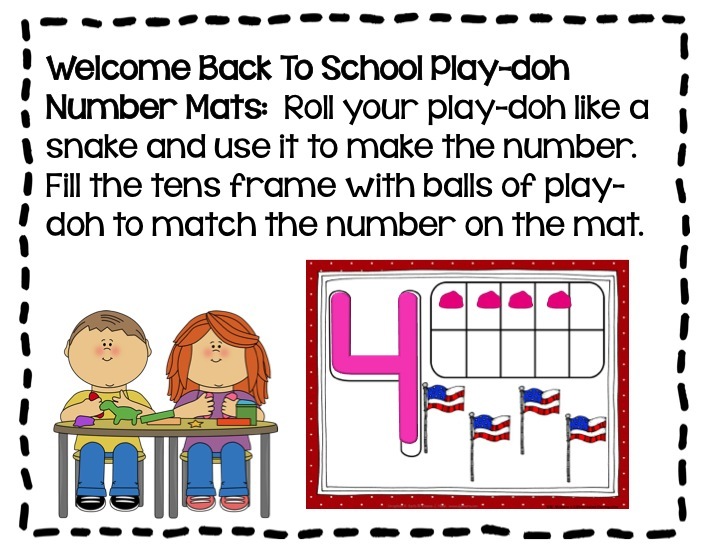 These Back To School Number Mats are another resource from Back To School Math Stations Galore. Again, the goal is to get them to start out using the materials correctly and practicing the procedures and routines. They do that by creating the number and then representing it in a ten frame. I start out small with only the numbers through 10 the first time around, and I can easily add additional numbers the second time through. Students will see this kind of station through out the school year, so giving them a good start is going to make a world of difference. Spinners are another tool that students will use all year long. I attach my transparent spinners with tape (I used washi tape this time so you can plainly see its tape.–I always get lots of questions about how I attach my spinners.) to a cd case or a dab of hot glue works as well. This means that I can change out the spinner cards by simply opening the case and replacing one for another. Students will learn this procedure because we use it a ton when we start to differentiate. 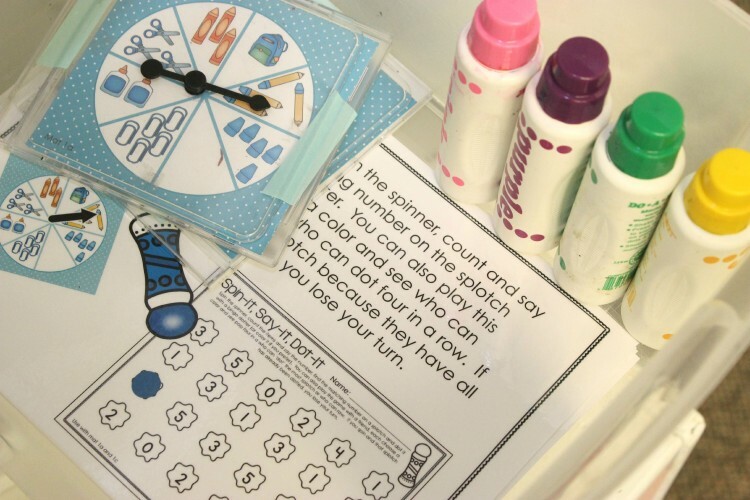 This particular resource is part of Back To School Spinner Math Fun Galore. Students will spin, count and find the corresponding number on their mat to ‘dot’ with the dauber. Will the dotting be perfect the first time through? Nope. They need to learn how to use them. So what I always do is give them a blank piece a paper and let them dot away for a couple of minutes, and then we can move on. 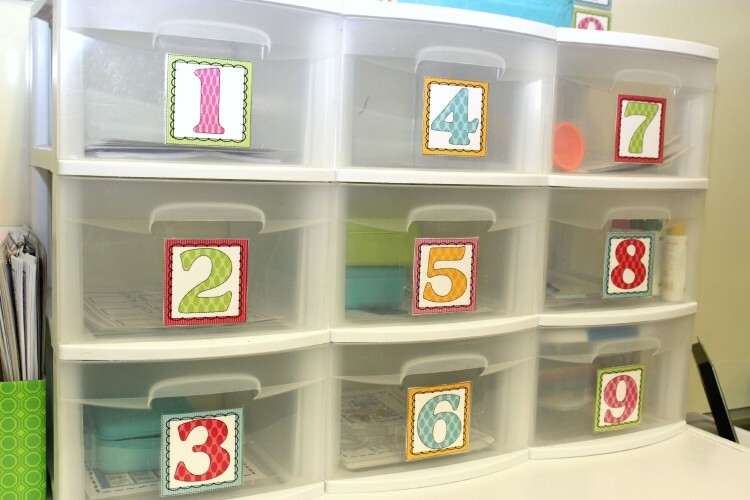 Station number nine is a FREE resource from Making Learning Fun. 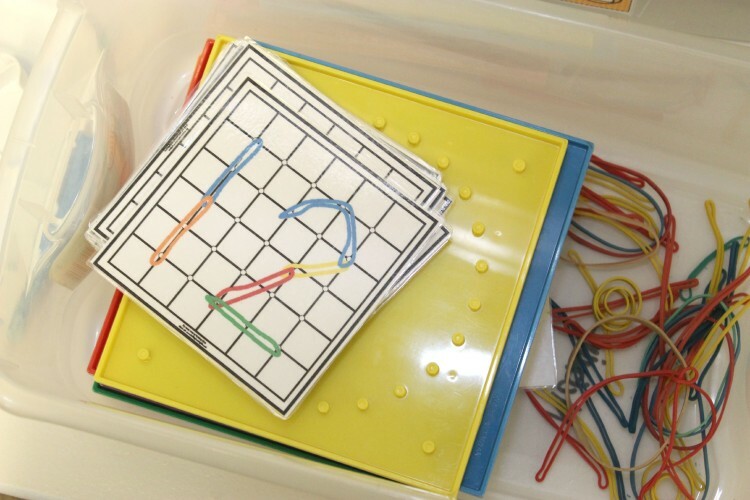 These geo board cards will help students work on fine motor dexterity and number recognition. Be prepared for a couple of rubber bands to go flying. It always happens, because they don’t have the best control, but they eventually learn and get really good at reproducing numbers, shapes and letters with these boards. You can find geo boards like the ones below by clicking HERE. Ok so now you’ve seen the setup and my plan. The next time I post about math stations, I’ll show you The Reality of The First Day of Math Stations, how I model routines and expectations and work through transitioning from one station to the next. Click on the picture below to take you there. You’ll see the importance of starting slow to go far. So many of these activities and games follow my students throughout the year. Taking the time to build those routines will be essential. 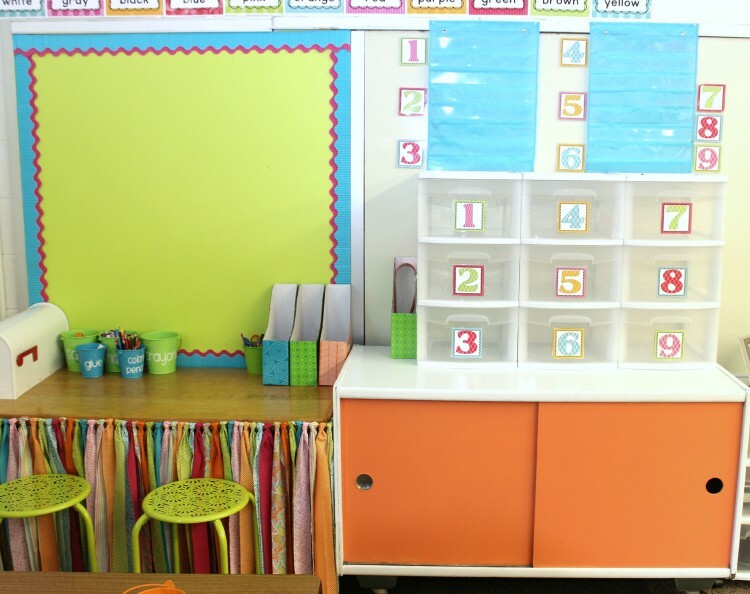 It makes changing over stations so much easier because the materials and activities are familiar –just new skills to keep them challenged and new themes to keep them engaged. So leave me any questions you might have, and I’ll make sure I include those too. I really believe that math stations can be the BEST part of your day. They certainly are MY favorite part of the day. Now check out what my first day of math stations was like by clicking HERE or the picture below. 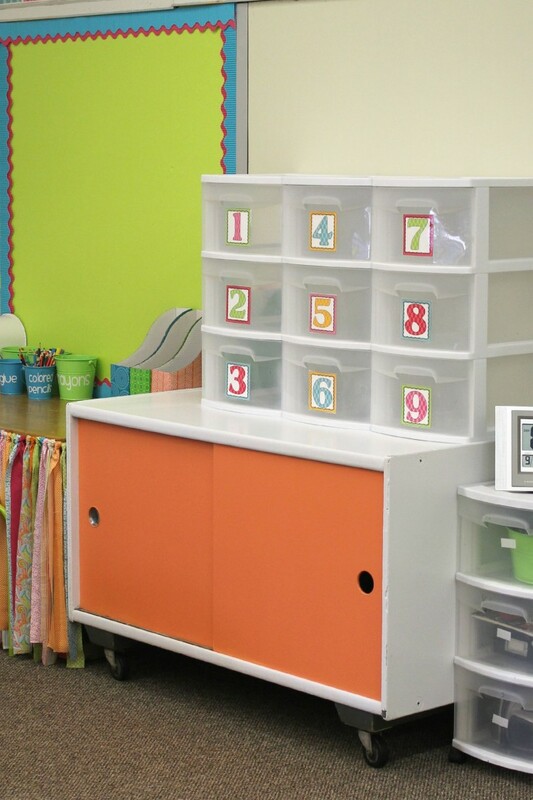 Follow Marsha McGuire (Differentiated Kindergarten)’s board Math Stations on Pinterest. I love this post!!! It’s very helpful. The biggest issue I have is how long it takes to clean out the stations, pack them up, and get the next ones out. I’m trying to pack each drawer up in its own ziplock baggie and put it in one of those Sterilite containers. Each month has their own box. Eventually I will have them all organized in a way that it will not take very long to change out the drawers. Oh Jan, I could use some of your 30 years of experience. Feel free to bless me with any golden nuggets of teacher wisdom you have. Love this post! Can you talk about introducing the centers? 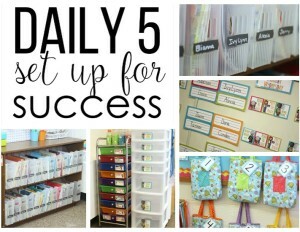 I have 25 students and we are implementing Daily 5 this year as well as work stations. I can do one for Daily 5 as well. Give me a couple of days. I need to catch my breath. I love your ideas! 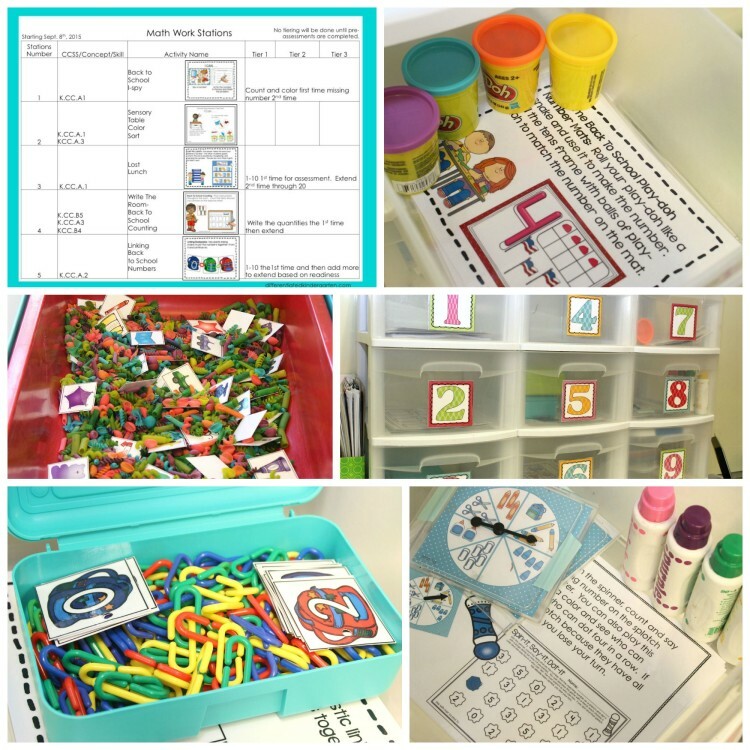 I am new to your blog and I am excited to see how you differentiate for these math centers. I like how you base your stations on different learning styles. That will keep everyone engaged. Thanks for the point about students doing the same thing again. I often wrestle with this in my own classroom. I feel a push to need to do everything only once. Students thrive in routines and having stations that are routines would be great! 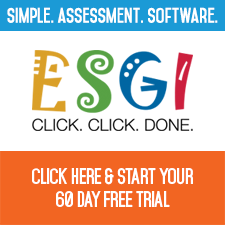 Do you assess learning styles through observation or do you have an assessment? Thanks for a great and inspiring post. I can’t wait to try these stations out! I assess learning styles a couple of ways. I always send out a student interest inventory before school starts in hopes that it might give me a head start with hone in on kids interests and ‘how they learn best.’ But quite honestly, so many of them have not been exposed to all the different MI categories, that I really try to make it a point to introduce the different areas and then observe. They’re little and need a lot of exposure and a lot of experience to know what their learning profile might be. Great questions. Thanks a ton for asking. Hello :). I am on day 18 with my class of 23. I have always wanted to do math stations. I guess I am confused where all of the materials come from. I know I can find them on TpT, but there are so many and so much to create. Help! Where do I begin? It looks like I could get some sterilite containers and supply boxes to begin with :). 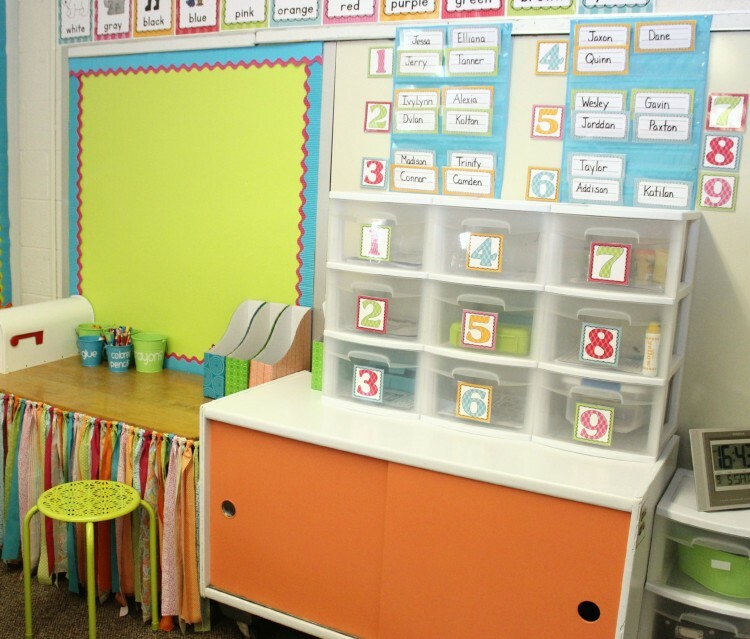 I would start with the Back To School Math Stations Galore. These stations will set you up for the rest of the year. 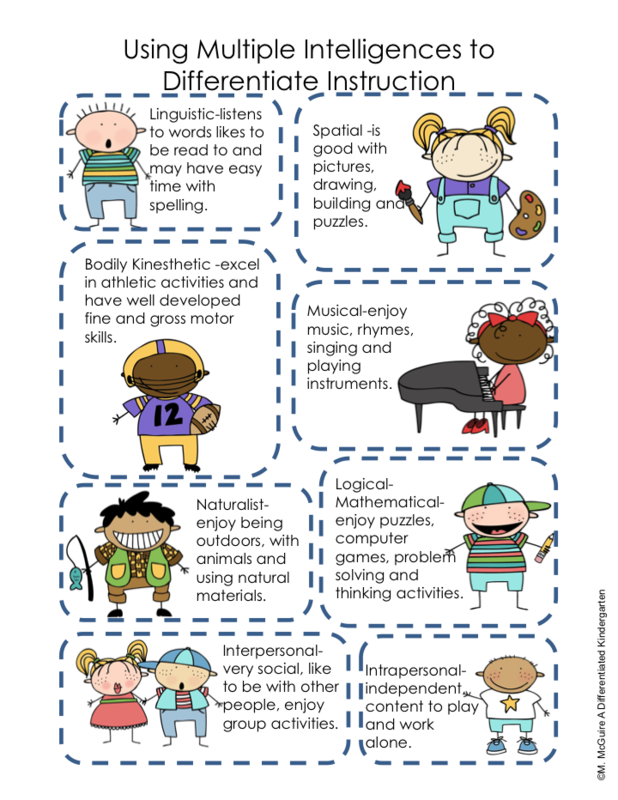 Activities become familiar and then very independent. Hi. How would you suggest 2 half day classes of 27? I just feel super stressed on time.